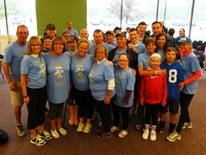 The STEEL Lillies is a non-profit group created in memory of Tiffany Lill to raise funds and awareness for Sarcoma / Cancer Research. Tiffany lost her battle with this terrible disease at the age of 39. She was a wife, mother, daughter, sister, aunt, cousin and friend. Her legacy will be one of HOPE for others out there who are continuing this fight! STEEL Lillies is dedicated to supporting Sarcoma Research at the James P. Wilmot Cancer Institute at Strong Memorial Hospital in Rochester NY. If you would like to make a donation, please make your check payable to Wilmot Cancer Institute and mail it to the care of C/O: STEEL Lillies / University of Rochester / Alumni and Advancement Center / 300 East River Road, Box 278996 / Rochester, NY 14627. Please put “Steel Lillies” on the Memo line of the check. You can also donate online through the University of Rochester's donation page. Thank you! 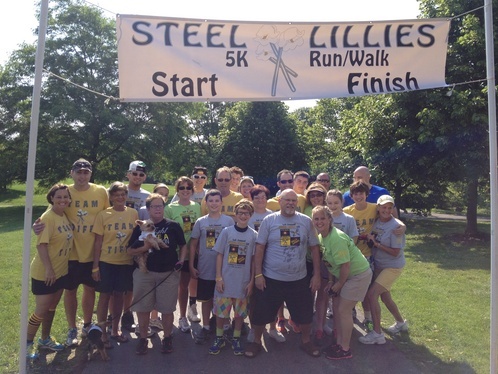 STEEL Lillies was founded in January 2012 with Tiffany Lill, who was undergoing her personal battle with Sarcoma. 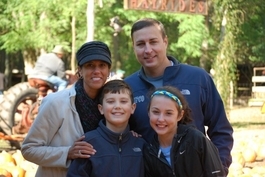 She wanted to raise awareness and funding for Sarcoma research, a little known cancer. At that time, Tiffany was in the middle of her sixteen month long fight with the disease. The Mother of two young children and lifelong “Flower City” resident would eventually lose her courageous battle on 4/9/12. The STEEL Lillies name symbolizes Tiffany’s beauty and toughness. The “STEEL” represents Tiffany’s unwavering strength and metal rods that were inserted into her back to support her spine after tumors grew around her upper back area. The “Lillies” represents Tiffany’s last name, as well as being her favorite flower. 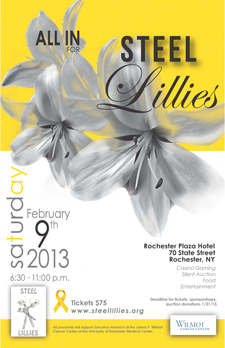 STEEL Lillies was founded in January 2012 with Tiffany Lill, who was undergoing her personal battle with Sarcoma. 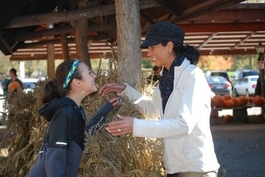 She wanted to raise awareness and funding for Sarcoma research, a little known cancer. At that time, Tiffany was in the middle of her sixteen month long fight with the disease. 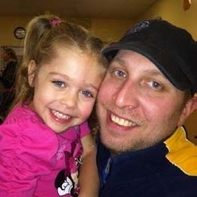 The Mother of two young children and lifelong “Flower City” resident would eventually lose her courageous battle on April 9, 2012. For the second year in a row, STEEL Lillies and the Wilmot Cancer Institute were the recipient of a very generous donation from the Webster Schroeder Boys Basketball Program. Each year, the Program holds a “free throw” fundraiser event that raises money for their Program as well as a local charity. This year’s event was held on February 2nd. Boys from the entire organization, grades 7th-12th, participated. On 3/20/19, Coach Spadoni, James Lill, Luke Insley, and Evan Ferrari hand delivered a donation check to Wilmot for $ 2,500!!! Thank you to Coach Spadoni, all the players, and their families who helped make this Fundraiser a success!!! STEEL Lillies is very thankful for this donation and their efforts to help in the fight against Cancer. The Schroeder Football Team's "Home Run Derby" Fundraiser on 8/4/18 raised $ 2,200. On August 30th, the team presented a donation check to Stephanie Sheets from the Wilmot Cancer Institute. Thank you again to everyone involved who helped make this event a success!!! The Home Run Derby Fundraiser on Saturday August 4, at Webster's Ridge Park will benefit the Webster Schroeder Football Program and STEEL Lillies. Check-in is from 3:30pm - 4:30pm and hitting goes from 4pm - 6pm. Please come out and support both organizations! Coach Spadoni presented a $2,700 check for the Steel Lillies to Payton and James on March 8, 2018 . The funds were raised through their Free Throw Fundraiser and included the entire Webster Schroeder Boys Basketball organization, grades 7-12. Thank you to Matt and all the boys!! A huge thank you to the Webster Women's Lacrosse Club. 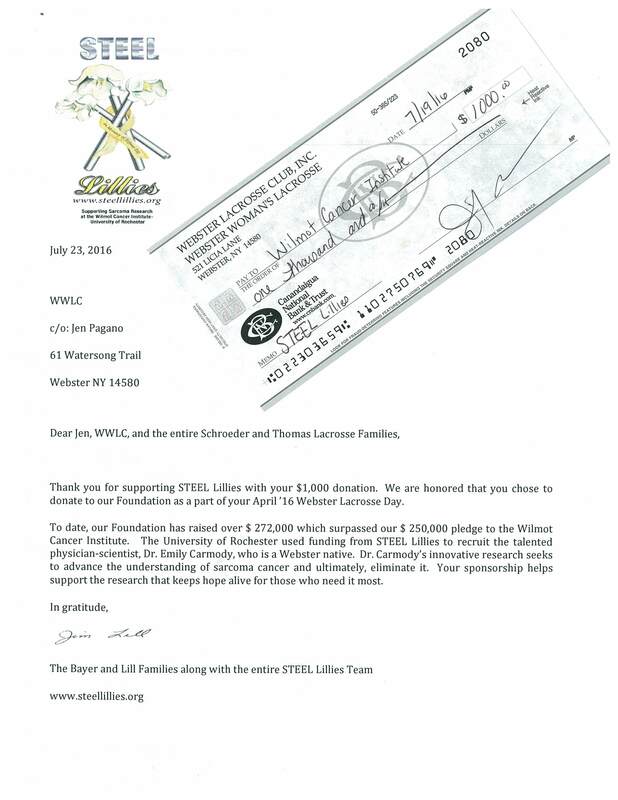 They recently held a "Webster Lacrosse Day" and donated $1,000 of the proceeds to STEEL Lillies! 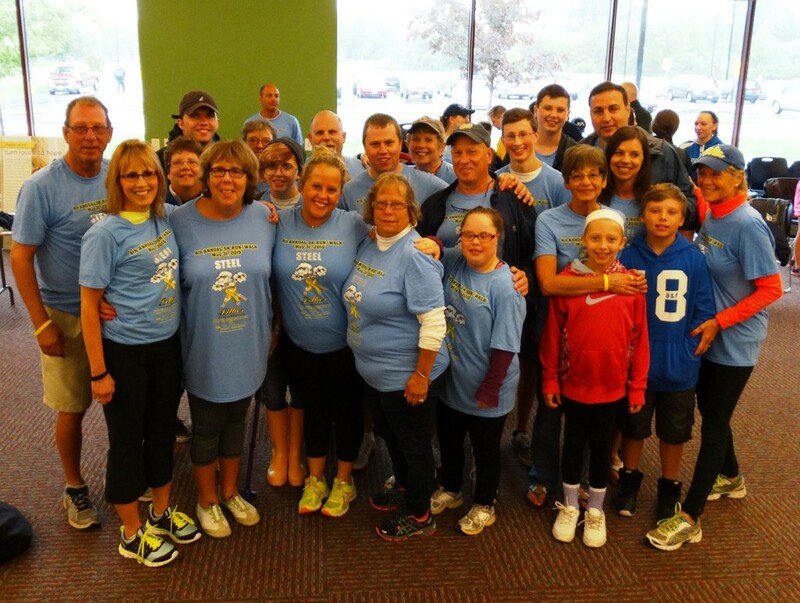 What a great day at the Pelican's Nest to benefit the family of Tim Thibault & STEEL Lillies Foundation. Thanks to all who came to support a wonderful family and cause. We are proud to share that with your help, we have raised a total of over $182,000 toward our pledge of $250,000 and every gift will be matched dollar for dollar by the University of Rochester’s Department of Orthopedics. Your support has and will continue to elevate the level of sarcoma-related research as well as the care of patients who face a Sarcoma diagnosis. Through the generous funds raised by the Steel Lillies Group, Dr. Emily Carmody was successfully recruited by the U of R and she began her work this past August. 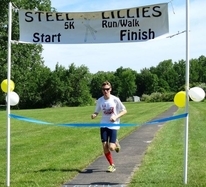 June 10, 2012 we held our 1st Annual STEEL Lillies 5k Run/Walk in Highland Park. We had over 900 participants in our inaugural event and were able to make an initial donation to the Wilmot Cancer Institute of $50,000. We could not do any of this without YOUR support and generosity! We hope to continue to have FUN events for this incredibly worthy cause. From everyone in the Bayer & Lill families, we thank you so much for your gifts in helping us honor Tiff. 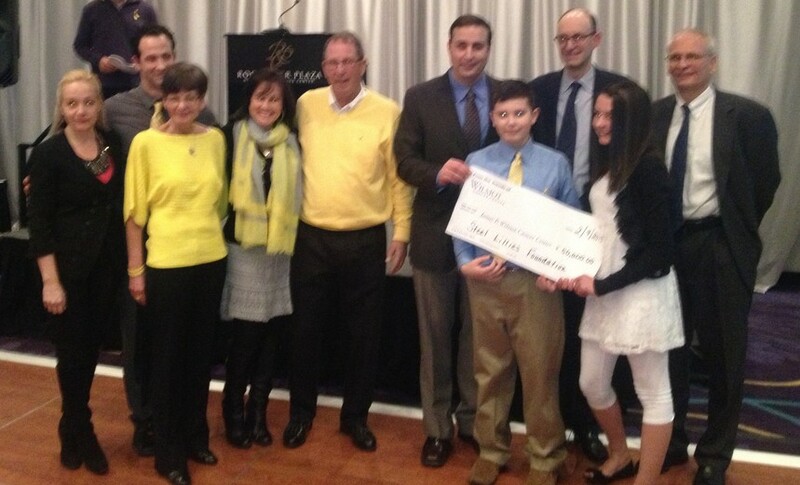 We are very happy to let everyone know that our 2013 ALL IN for STEEL Lillies event raised $57,000. That brings our total raised to $107,000 for the Wilmot Cancer Institute. Thanks to your generosity and support, we are more than 40% to our goal of a $250,000 donation. 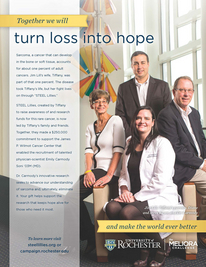 Together we are making a positive impact on Sarcoma research in Tiff's name. Thank you again for your continued support!